Home » BLOG » Teeth implants » What are the reasons for dental implants? We need our teeth for a lifetime. Still, mainly in adulthood, we might lose them. When this happens we of course we are shocked, but we shouldn’t be. Nowadays there is a solution for regaining our perfect smiles and eating our favourite dishes just like before. By getting dental implantation, one of the most modern method of replacing missing teeth, we can improve our quality of life. What can we do for replacing missing teeth? What should be known before the implantation? Sometimes people lose a tooth in an accident. This mainly happens to the front teeth and the incisors. The other most common reason for teeth loss is tooth decay and periodontal disease. With missing teeth we cannot chew food properly, we are afraid to smile, and we even form words in a different way which changes our manner of speech. Of course we can prevent tooth loss by healthy eating, regular and right teeth brushing and regular dental examinations. Unfortunately, most people realize it too late – only after they have lost some teeth. There are more solutions for replacing missing teeth, such as dental bridges, or removable dentures. In the case of the latter, patients often complain about their look or feel them being uncomfortable. The most reliable and aesthetic method of teeth replacement are dental implants. They replace the roots and therefore act as natural teeth. 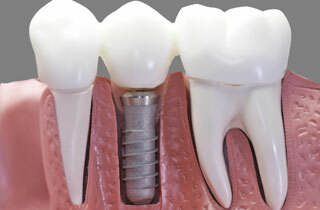 Dental implants differ from other solutions of teeth replacement in that they are much more stable and much stronger. Therefore we can live with them confidently, just as if we did with our natural teeth. Our eating habits can also turn back to normal. Besides feeling like natural teeth, they also look like natural teeth. This means that we can talk and smile just like before and no one will notice the difference. Living with dental implants is like regaining our own teeth, significantly improving our self- confidence. A dental implant is an artificial tooth root. The dentist inserts this artificial root made of titanium in the jawbone. In few months’ time this artificial root perfectly amalgamates with the bone tissue. After this healing period the dentist places the superstructure. First he must reopen the gums with a small incision to expose the implants. Then he places the implant abutment together with the gum forming abutments. On these abutments he inserts the crowns made of the selected material. An implantation is possible in case of either one or more teeth missing. Only very few patients complain about pain during the surgery or irritability following it. In any case, After the treatment the patients receive pain killers as well as antibiotics. With proper oral hygiene dental implants can last even for decades. Before the implantation it is important to check whether the patient has sufficient bone tissue. If they do not, the dentist must perform bone grafting. A healthy gum is also necessary for an implantation, so if the patient has inflamed gums, it has to be treated first. Diabetes, osteoporosis, haemophilia or strong smoking habits can present serious risks. In these cases only rarely the dentist can carry out the traditional procedure of the implantation. As you can see, you need a thorough consultation with your dentist before the implantation. Only with all this data he can plan the procedure of the implantation and prepare an exact treatment plan and price plan for you.